Poison Ivy is a seasonal type rash. Most people contract poison ivy by touching the poison ivy, poison sumac or other similar plant species. Poison Ivy is found in every state in the US except Alaska, California, Colorado, Idaho, Hawaii, Puerto Rico, Virgin Islands, Oregon, Washington, North Dakota, Montana, Utah, New Mexico, Neveda and Wyoming. Posion Oak is found only in the following states which are California, Neveda, Oregon and Washington. Poison Sumac also has a wide distribution. It is found in Texas, Minnesota, Wisconsin, Illinois, Louisiana, Kentucky, Tennessee and the rest of the eastern US states. The best way to identify Poison Ivy is to look for the maple leaf. 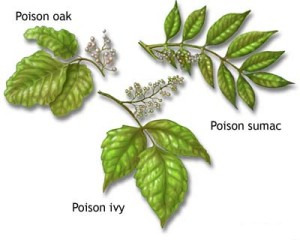 The best way to identify Poison Oak is look for shiny red or green leafs. The plant looks pretty similar to Poison Ivy. Poison Sumac are the easiest plants to identify because they have reddish or grayish tip consisting of 7 to 13 stems. Poison Ivy is not contagious. The way to get Poison Ivy, Poison Oak, or Poison Sumac is to touch the plants. Some people are immune to Poison Ivy but many people are not. Also, people that are immune to Poison Ivy may not be immune a year from now. If you accidently touched a poison ivy plant, wash your hands with soap and water immediately. If a rash starts to develop, use Poison Ivy Lotion on the rash. The lotion will help stop the itch and prevent infection. Poison Ivy Pills should also be taken at a general interval to get rid of the rash. Pills should be taken every hour or two during the initial start of the rash. As the rash subsides decrease the usage to every 3 or 4 hours. As the rash starts to go away you can decrease the dosage even more. Poison Ivy pills can also be taken before you get poison ivy. The pills help to give you a little more immunity if you do touch poison ivy. The rash may be milder if these pills are taken.